Long ago, in the oldest part of Siam, called Panchala Nakhon, there lived a handsome young man named Prince Suthon he was the only child of King Athityawong and Queen Chanthathevi. The young prince was a remarkable young man, handsome, intelligent, and kind. It seemed as if he had mastered every grace and showed an aptitude for many skills, but in one sport, archery, he had exceptional ability. In the kingdoms to the east and west of Panchala Nakhon, Prince Suthon was called Good Arrow. Good King Athityawong and Queen Chanthathevi were proud of their son and were determined to find him a wife who was as beautiful as the rose and as gentle as a doe. The king and queen observed many young ladies, but none of them showed promise of being a gracious and noble queen. One spoke with a harsh twang in her voice. Another lacked grace in her walk The third was not clever enough, and the fourth was plain. The fifth could not sing sweetly. The sixth could not dance gracefully. The seventh lacked regal poise. When the eighth princess was rejected because she giggled too much, the entire kingdom became concerned. One day, Boon, the most famous hunter in Panchala Nakhon, discovered the secret bathing pool used by King Tumerat seven beautiful daughters King Tumerat was a great king who ruled over the Bird People in the far north. It is said his daughters were the most beautiful young ladies in the world. They all wore soft-feathered wings that could be removed at will. Without the wings the Bird Maidens looked exactly like other girls. When Boon saw the seven pairs of feathered wings lying on the grass, he quickly ran to the kind old serpent, the Naga of Champoo Chit, and borrowed his magic noose. Then he stealthily crept along the bank of the bathing pond and snared Manora, the youngest and fairest of all the Bird Maidens. Boon carried Manora to the palace and presented her to King Athityawong and Queen Chanthathevi. Suthon," said Boon. Boon's prediction was fulfilled, for Manora's natural loveliness and gentle charm captivated every member of the royal household. Prince Suthon and Princess Manora fell in love and the entire kingdom rejoiced at the news of their wedding. Manora answered, "Suthon, my only request is that you never leave my side. When you are near me, I am happy. When I am alone, I think of my father and my Sisters and I become sad." Unfortunately, Prince Suthon was forced to leave Manora soon after their wedding. "I must help my father's soldiers defeat the enemies who attack at the northern boundary. Please understand," said the prince. The prince asked a trusted friend to take care of Manora. "Guard her well," he said, "She is the jewel of our kingdom, and the treasure of my life. Friend, do not neglect her. Watch her night and day, and as a reward for your service, I shall make you the Royal Court Counselor." Suthon's friend promised and all would have gone well except for one thing, the old court counselor had overheard the conversation. Late that night King Athityawong had a most strange dream. He called the old court counselor and said, "Last night, in my sleep, I saw my intestine unwind from my body. It rose like an enormous rope and wrapped itself around the entire kingdom of Panchala Nakhon. What does this mean?" The jealous old man immediately saw a way to save his position. He rubbed his chin and looked very wise as he said, "Your Majesty, your dream is a sign that a great evil will soon fall upon you, your family, and the kingdom. So great is this evil that all may die in its grasp." The king sat up very straight and whispered, "How can we prevent this evil from coming?" "There is only one way to appease the gods, Your Majesty," said the court counselor. "I'll do anything you say," murmured the king. "You must make a blood sacrifice. You must sacrifice the Bird Woman." "No," shouted the king, "Prince Suthon loves Manora more than anything in this world." "Does she mean more to you and the prince than your own beloved queen and all your subjects?" The king had no choice; yet, the horror of his decisions drove him into isolation. He placed guards at his door and ordered them to keep everyone away, including the queen. The queen thought her husband had lost his mind. She spent each day trying to see him and then, when that failed, Consoled Manora, "Don't worry, child," she said, "we shall find a way for you to escape." "Good mother, you know Suthon would not want me to die. Please, bring me my wings," begged Manora. The next day a crowd assembled to watch the blood sacrifice. When the gates of the courtyard swung open, Manora was not tied to the stake. Her graceful wings were attached to her body. She was swaying as gently as a flower in the wind. Her arms moved slowly and her legs guided quick running steps. Suddenly, her wings stretched outward and as quietly as a swallow she flew over the palace and into the sky. "May she reach her home safely," whispered the Queen. "I wish her well," said the king. Manora flew immediately to the house of the wise old hermit who lived in the clearing near her bathing pound. She paused just long enough to say, "Wise one, if my husband comes to find me, please give him my ring of red rubies." "Bird Maiden, you know the prince will seek to the ends of the earth for you. I shall give him your ring and my blessing. " Manora's eyes filled with tears as she said, "What you say is true. Please, try to protect him from harm. Will you teach him the prayers which will protect him from evil?" "I will do that and more, Manora. I shall teach him the language of the birds and animals, and I shall give him some powerful magic." Manora gently fluttered her wings and flew into the sky, heading in the direction of Mount Krailot where her father and six sisters were waiting to welcome her home again. As soon as Prince Suthon discovered what had happened, he set out to seek his wife. For many days lee traveled into areas where no one had gone before. Wherever he went he asked, "Can you direct me to the land of the Bird People If But always the answer was the same until the day he discovered the wise hermit of the north country. "Yes, I can direct you to the land of the Bird People. Tile way is perilous, but if you know the secret prayers, and carry my magic lotion, I think you will be able to arrive there safely. For added protection I shall give you my pet monkey. Never put a berry or a jungle fruit in your mouth unless the monkey eats it first," said the hermit. "If you do all this, I shall be eternally grateful," said the prince. The hermit gave Prince Suthon Manora's ring of red rubies, taught him special prayers, the language or beasts and birds, and directed him northward. For Seven wars and seven months Suthon traveled through jungles, forests, thorny fields, and over the highest mountains. Then he met a monstrous creature called the Yak. The Yak stood seven times taller than the tallest man. His breath was a flame of blue fire. Smoke sifted through his nostrils and rose into the sky. Prince Suthon said the secret prayers, and the fierce Yak knelt down before him. The next obstacle was a river of blazing, dancing red flames. The prince said the secret prayers and immediately a huge boa constrictor appeared. He stepped upon its back and safely rode over the river of fire to the opposite bank. The prince had scarcely taken a dozen steps when he discovered his path was blocked bit an enormous tree unlike any he had ever seen before. The thick jungle growth prevented him from going around it. The strong, sturdy roots prevented him from digging under it. With no alternative, the prince climbed the tree, but fell asleep in the branches. The next morning he was awakened by the chirping of two great birds. They were larger than tigers and wore glittering feathers of sparkling gold and gleaming feathers of shining silver. Prince Suthon listened carefully, and to his great surprise, he discovered that he was able to understand the birds. The first giant bird said, "If we go to Mount Krailot tomorrow, we shall have a feast." "Oh yes, I heard King Tumerat was having a celebration in honor of his youngest daughter. By all means, we should go, but first we must rest. Mount Krailot is far to the north," the second bird replied. Prince Suthon unleashed his little monkey and set him free. Then he climbed on the back of one of the huge gold and silver birds and nestled under the metallic feathers. Early the next morning the great birds stretched their wings and flew directly to the lotus pond in King Tumerat's garden. 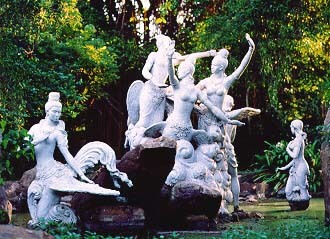 Prince Suthon arrived just in time to see a party of bird hand maidens carrying golden pitchers to the pond. "Our Princess Manora cries all day, no matter what we do. She yearns for her prince who is far away beyond the mountain blue," sang one little servant. "Good maiden, are you carrying your golden pitcher to Princess Manora's chamber?" "Indeed, I am," said the little girl. "It is a heavy burden for one so small," said the Prince. "Here, let me carry it for you." The prince slipped off his ring of red rubies and dropped it into the golden pitcher. When the hand maiden splashed her pitcher of water over Manora, the ring of red rubies clinked before her. "Tell me quickly," shouted Manora, "have you seen a strange man in our garden?" "Yes, My princess, he helped me carry the golden urn full of water." Manora grabbed her servant's hands and danced merrily around the room. "Quickly, take perfumes, jewels, and silken clothes to him. He is my husband, and he must be dressed properly before he meets my father." An hour later Prince Suthon was presented to Manora's father, the great King Tumerat. "Prince Suthon, we Bird People are impressed with your devotion to Manora; however, before you may claim her as your won, you must prove yourself worthy." "Your Highness, I have traveled for seven years, seven months, and seven days looking for Manora. Now that I have found her, I shall do anything you request in order to gain your blessing on our marriage," said the prince. "Your first test is a test of strength. Can you lift the solid stone bench in my garden?" Prince Suthon calmly walked to the bench, knelt before it and prayed to the gods for strength. The next moment he grasped the stone bench and raised it above his head. The gasp of those present was like a swish of wind in the treetops. "Well done," said the King. "Now, since you wish to take Manora from her homeland, you must prove that she is the only maiden you desire. Can you select her from a group of seven young ladies." "I would know Manora anywhere," said the prince. But he wished he had not spoken so quickly because the next instant seven identical Manoras danced in front of him. The prince prayed to the gods for help and in response a golden butterfly appeared. It flew three times around the head of the girl in the center. Prince Suthon took her hand, led her to the king, and said, "This is my Manora.'' The king smiled with approval. "Only one task remains, Prince Suthon. You must shoot an arrow through seven palm boards, seven figwood boards, seven plates of copper, seven plates of iron, and through seven bullock carts filled with sand. If you can do this difficult task, Manora shall be yours forever." The prince did not pause for a moment. After all, his name had come to mean Good Arrow. With one quick, sure stroke he placed his sharpest arrow in his crossbow and let it fly. Like a stroke of lightning the arrow pierced through the palm boards, figwood boards, copper plates, iron plates, and sand-laden bullock carts. It is said that even then the arrow did not waver as it soared straight into the open sky and disappeared from view. The king watched the arrow fade into the distance and said, "Prince Suthon, you may take Princess Manora to your homeland." From that eventful day until the end of their lives, Princess Manora and Prince Suthon lived happily ever after in the prosperous kingdom of Panchala Nakhon.